Trickle Creek Lodge Hotel at Kimberley Alpine Resort, BC . 1 night stay and 1 round of golf. Accommodation valid for a one night stay at Trickle Creek Lodge and one round of golf at Wildstone Golf Course. Restrictions do apply, taxes not included. One-bedroom suites based on double occupancy and two-bedroom suites based on quad occupancy. 2 nights stay and 2 rounds of golf. Accommodation valid for two nights at Trickle Creek Lodge and one round of golf at Wildstone Golf Course and one round of golf at Cranbrook Golf Club. Stay a night and golf all you can in one day at Trickle Creek Golf Resort. One-bedroom suites based on double occupancy and two-bedroom suites based on quad occupancy. Taxes not included. Some restrictions may apply. 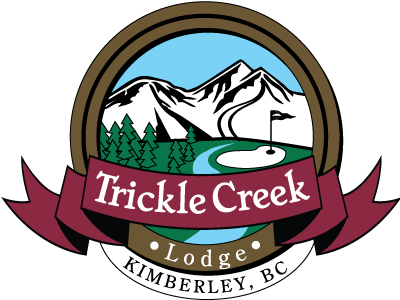 Stay a night and play on round at Trickle Creek Golf Resort. One-bedroom suites based on double occupancy. Taxes not included. Some restrictions may apply. Prices may very depending on month and day of the week. Accommodation valid for one night and one round of golf at Trickle Creek Golf Resort. One-bedroom and studio suites based on double occupancy. Package prices will vary based on month and day of the week, taxes not included. 2 nights stay and 3 rounds of golf. Accommodation valid for two nights, one round of golf at Trickle Creek Golf Resort, one round at Bootleg Gap Golf Course and one round at Kimberley Golf Club. Accommodation valid for two nights, one round of golf at Trickle Creek Golf Resort, one round at Bootleg Gap Golf Course and one round at Wildstone Golf Course. One-bedroom suites based on double occupancy. Package price based on mid week. Weekend prices available, taxes not included. Package price based on mid week, weekend prices available. Some Restrictions do apply and taxes are not included. Includes a $10pp gift card to the Buckhorn and Main restaurant for the first night. Magic Line, Rails to Trail, and the Nature Park biking trails are conveniently located near the hotel. Relax those sore muscles in one of our outdoor hot tubs or take a dip in our heated pool. Secure bike storage. Based on double occupancy in a studio or one-bedroom suite with a full kitchen and balcony. Additional upgrades to this package are available including dinner at the hotel's restaurant and lounge, flowers and chocolates. Call our friendly reservation desk and we will be happy to personalize your perfect getaway! Valid for a one-bedroom suite with a full kitchen, living room and balcony with mountain views. Enjoy the hotel amenities while you are with us – pool, hot tub, fitness center, and the hotel's restaurant and lounge.